The Tesla Conundrum: The Brand is Gold, the Financials are Not - Cox Automotive Inc.
Tesla excels in the strength of its brand and shopping consideration in the electric vehicle segment, according to Cox Automotive data. Where Tesla needs work is in the two characteristics that luxury shoppers deem most important – durability/reliability and safety. Lexus leads in durability/reliability and Tesla is just above average. Tesla wins in consideration with consumers shopping for electric vehicles, according to a Cox Automotive study. The problem is the EV market is still just a niche market and that isn’t likely to change for some time. Tesla released fourth-quarter and full-year 2018 financial results today that illustrate the electric-vehicle maker faces formidable challenges, compounded by the fact that numerous new EV competitors are gunning for Tesla with new models. But where Tesla excels is in strength of its brand and shopping consideration in the electric vehicle segment, according to Cox Automotive data. Tesla’s share price has fallen almost 14 percent in the last 12 months, and it has a $920 million debt due March 1. Tesla may be forced to seek more funding from the capital markets, something Tesla CEO Elon Musk said he didn’t want to do. Tesla buyers will no longer receive the full $7,500 federal tax credit because Tesla has reached its maximum of 200,000 vehicles sold, causing concern that Model 3 sales will be hampered. Increased competition, volatile stock price, a hefty payment due, a need to expand and freshen its model line and bleak prospects for any significant profits prompted Tesla to recently slash its workforce by 7 percent. 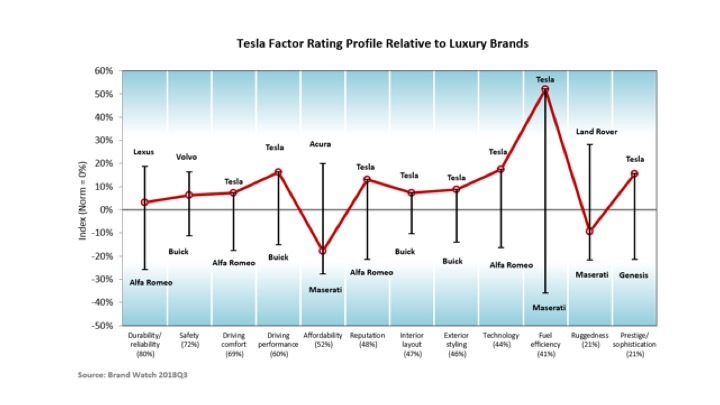 Despite very real challenges, Tesla continues to lead the luxury segment in brand strength, according to Kelley Blue Book’s Brand Watch, an online and model perception tracking study of new vehicle shoppers. 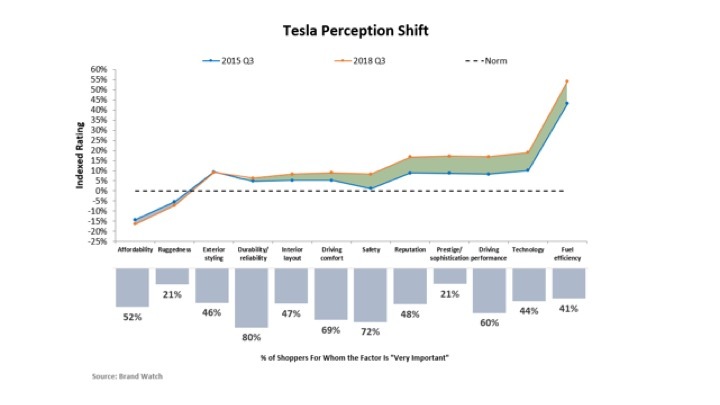 Tesla ranks tops in consumer perception in eight of 12 factors monitored by Brand Watch. In some cases, it ranks top by a wide margin, particularly in fuel efficiency as well as prestige, reputation and technology. Not surprisingly since its models are pricey, Tesla ranks low on affordability as well as ruggedness, not part of Tesla’s DNA. 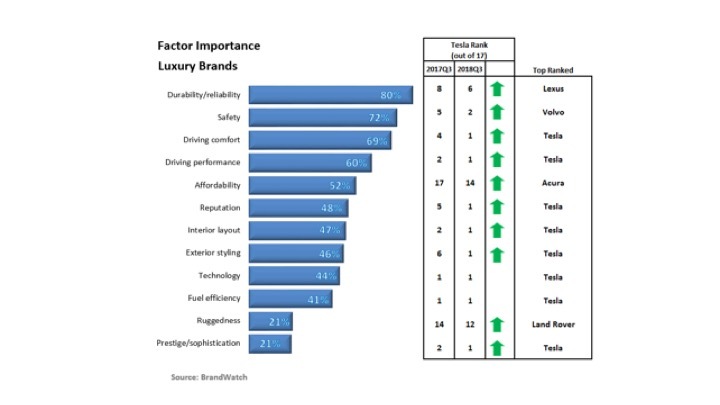 Where Tesla needs work is in the two characteristics that luxury shoppers deem most important – durability/reliability and safety. Lexus leads in durability/reliability and Tesla is just above average. Volvo leads in safety with Tesla only somewhat better than average. Tesla has been tops in several categories for a few years. Further, in contrast to some of its luxury competitors, Tesla’s consumer perception has improved in almost every category since 2015. Its perception of affordability worsened, not helped by the fact that a promised, affordable $35,000 Model 3 is still not available. Still, the Model 3, according to KBB Brand Watch, has exceptional perception, as do the Model S and Model X. The Model 3 also has exceptional shopper consideration. Indeed, Tesla wins in consideration with consumers shopping for electric vehicles, according to a Cox Automotive study. The problem is the EV market is still just a niche market and that isn’t likely to change for some time. The study showed consumers have a lot of questions about and need education on electric vehicles before they go mainstream. Further, they need more reason to buy them than just the fact that they are electric. The Tesla brand shows that electric vehicles can dominate in the image wars. The only question, can the business survive?